, an eminent Greek orator, was born at Athens, in the 86th olympiad, five years before the Peloponnesian war, and 436 B. C. At an early age he began to study philosophy and rhetoric under Gorgias, Prodicus, and Tiseas, whose doctrines and eloquence about this period astonished all Greece. It is affirmed that he also was a disciple of the celebrated orator Theramenes, whom the thirty tyrants caused to be put to death because he favoured the popular cause. He passionately loved glory; and the desire of distinguishing himself, and of bearing a part in the public administration, animated all his proceedings. 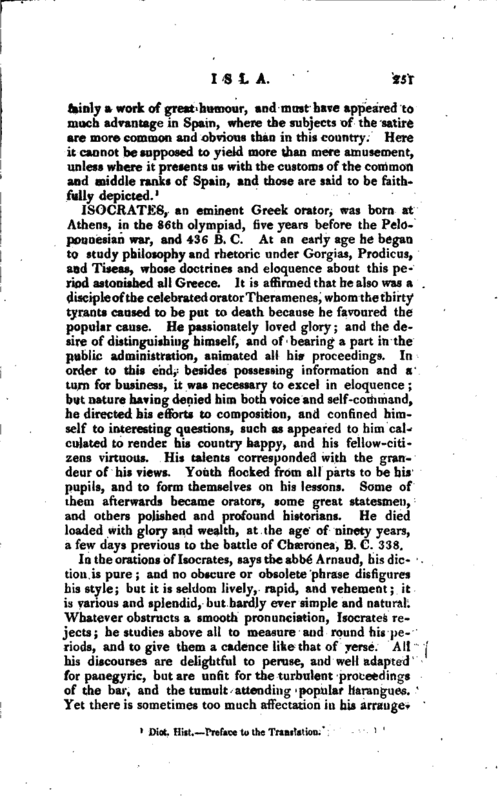 In order to this end, besides possessing information and a turn for business, it was necessary to excel in eloquence; but nature having denied him both voice and self-command, he directed his efforts to composition, and confined himself to interesting questions, such as appeared to him calculated to render his country happy, and his fellow-citizens virtuous. His talents corresponded with the grandeur of his views. Youth flocked from all parts to be his pupils, and to form themselves on his lessons. Some of them afterwards became orators, some great statesmen, and others polished and profound historians. He died loaded with glory and wealth, at the age of ninety years, a few days previous to the battle of Chaeronea, B. C. 338. In the orations of Isocrates, says the abbe Arnaud, his diction is pure; and no obscure or obsolete phrase disfigures his style; but it is seldom lively, rapid, and vehement; it is various and splendid, but hardly ever simple and natural. Whatever obstructs a smooth pronunciation, Isocrates’ rejects; he studies above all to measure and round his periods, and to give them a cadence like that of verse. 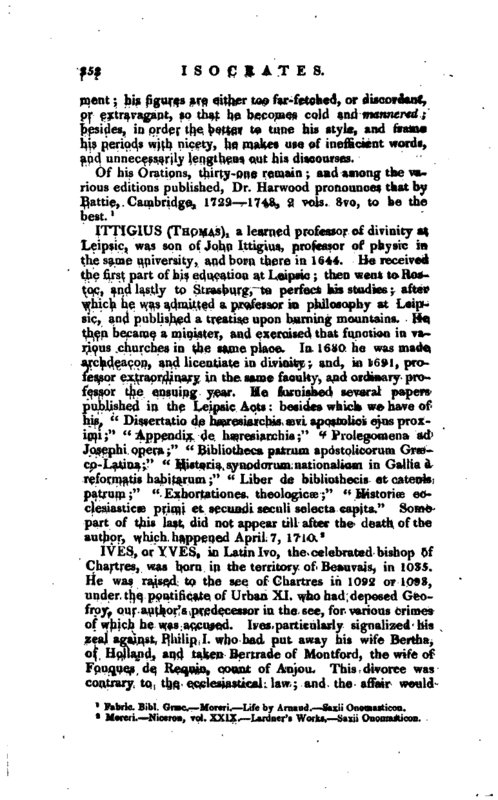 All his discourses are delightful to peruse, and well adapted for panegyric, but are unfit for the turbulent proceedings of the bar, and the tumult attending popular harangues. Yet there is sometimes too much affectation in his | arrangement his figures are either too far-fetched, or discordant, or extravagant, so that he becomes cold and mannered besides, in order the better to tune his style, and frame his periods with nicety, he makes use of inefficient words, and unnecessarily lengthens out his discourses.